Halsey announced the news on Instagram. G-Eazy and Halsey have been going strong for the past year. Since announcing their relationship, they've damn near been inseparable. They were constantly spotted together on red carpets to award shows, at music festivals and even performing together on the Jimmy Kimmel Live stage as well as working on music together. While they've been side by side through the hardships they've faced in the public eye in recent times, the two of them have officially called it quits. Halsey took to Instagram to reveal that she and G-Eazy have split. While she didn't reveal exactly why they're breaking up, she said that she's looking forward to focusing on making music and touring. "I normally keep this kind of thing private but provided our public. nature I feel the need to inform my fans. 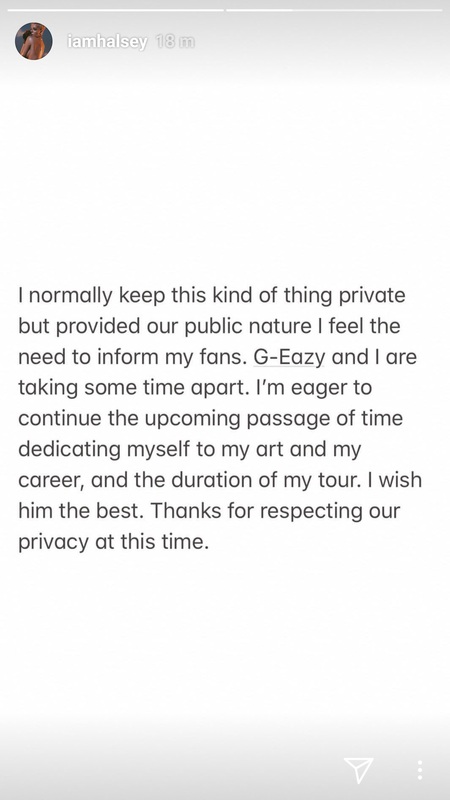 G-Eazy and I are taking some time apart." She wrote, "I'm eager to continue the upcoming passage of time dedicating myself to my art and my career, and the duration of my tour. I wish him the best. Thanks for respecting our privacy at this time." In addition to announcing their split, she's pretty much deleted every picture of G-Eazy off of her Instagram page as TMZ pointed out. At this point, G-Eazy hasn't made any comments on their split but we'll keep you updated.